Sarah Brown vs. Sam Cam – what role will Twitter play in the general election? Social media is set to be a big factor in the upcoming general election, with an increasing number of MPs canvassing for votes through the medium of Twitter, and an equally high number of potential voters voicing their opinions on the political party’s policies. 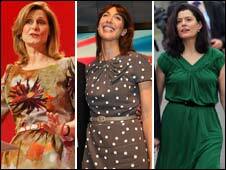 Now that the leaders’ wives play a much more visible role in campaigning, I have found myself warming more to Sarah Brown than her counterparts Samantha Cameron and Miriam Clegg, and I suspect this has much to do with the wonderful Twitter. Of the three wives, Sarah is the only one to have an active Twitter account, and being the avid Twitter addict that I am – I am of course a follower of Gordon’s other half. Regular updates from Sarah (and yes I do feel that as a close, personal Twitter follower, it is acceptable for me to be on first name terms with her…) let me know where she is on the campaign trail (Kent last week), updates on her charitable work and even news on her latest cooking endeavours (which I imagine will be less regular in the coming weeks…). This insight into her life makes her slightly more accessible to the masses…and also slightly more endearing. My only access to Samantha Cameron is through the newspapers, often critical, articles about her outfit choices – there is just no glimpse at the real person there. Twitter has the power to revolutionise this year’s general election because it makes politics available to a generation which might not have previously engaged with it. Sarah Brown has the potential to put Labour one-step ahead by providing the human and familiar face of the party. I am still an undecided voter, so I cannot yet say whether Sarah’s social media presence, or the general debate taking place on Twitter, will sway my vote – but I will keep you posted!